The text message came just before 7 a.m.: “Mandatory evacuation for the entire city of Malibu.” I grabbed my car keys, wallet, phone, laptop, writing stuff, and a change of clothes. It was Friday, November 9th. I was not worried. Malibu gets a fire nearly every year. Never do they creep down the Santa Monica Mountains, leap the Pacific Coast Highway, and take out homes where I live, in Point Dume. But this one did. And it took out my home with an almost personal vengeance. Watching KTLA news with a friend in his Venice Beach studio the following evening, he pointed at the screen. “That looks like your house.” The camera zoomed in. “That’s definitely your house.” The shot—a firefighter blasting water at my inflamed bedroom—would play on repeat throughout the weekend. I became a kind of poster child for the Woolsey Fire. The next few days threw into sharp relief my conflicted relationship with Malibu life. Many of my fellow-evacuees landed comfortably in Venice and Santa Monica. I received invitations to festive dinners and brunches at upscale eateries. Designer fashion labels offered free clothes to folks who’d lost their homes. A two-hundred-and-fifty-dollar gift certificate for luxury bedding showed up in my in-box. Compared to the extreme loss of life in the Camp Fire, it felt way too easy. Even in evacuation mode, we kept up our tenor of self-congratulation. Meanwhile, I could not get back into Malibu. Roads were closed on the north, south, and valley sides. The “stayers,” several of them surfer friends of mine, posted on social media about “never feeling a stronger sense of purpose” and “being honored to serve their community.” The Point Dume Bomberos, a vigilante group that formed in the fire, were saving houses. Supplies were coming in by boat; surfers were paddling them to shore on longboards. Malibu moms were cooking up hot meals in jury-rigged kitchens. I was hit with a sense of fomo/shame. I’d got out of the fire, and now all I wanted was to get back into the fire. I got in the following day with a makeshift press pass. Driving west past Surfrider Beach, the Pacific Coast Highway eerily quiet, I watched a set of waves peel across First Point, no riders. Malibu is one of the most crowded breaks on earth. The road closure would create empty lineups akin to the pre-“Gidget” days. I reached back and pawed the nose of my five-ten twin fin. I passed places of great personal significance: the surf spot where I got my first tube, in 1978; the former home of the Malibu Inn, where in my tormented teens I consumed a half decade’s worth of soggy oatmeal and burnt coffee hoping to get closer to a particular waitress; the rocky outcropping where my late wife and I shared one of our last meals together, a picnic of cheese and avocado sandwiches, the shore break slapping and hissing below our feet. I started surfing in the late seventies. Malibu was my playground; it’s as close to my heart as any geographical place I can think of. But to be a surfer is to be a traveller. In my early twenties, I started travelling, and pretty much kept travelling. 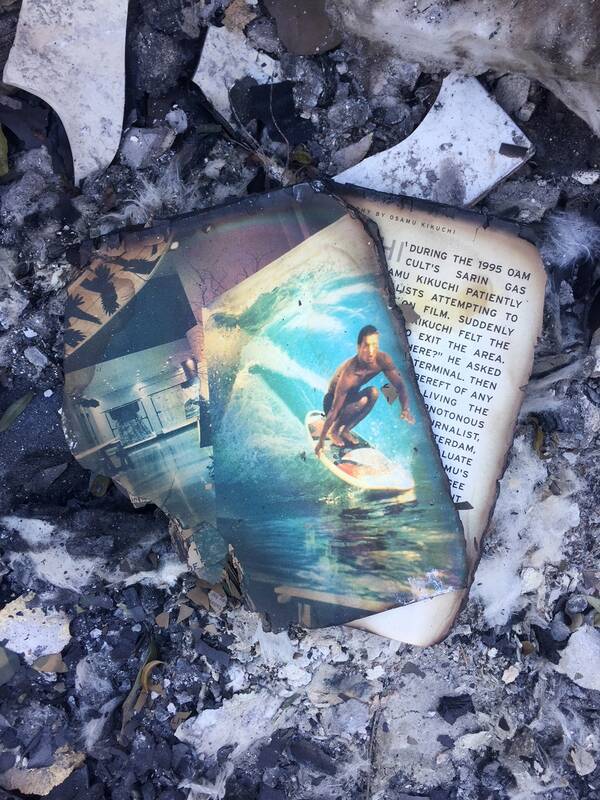 The first sightings of the fire were just north of Pepperdine University. The charred hills took on a certain vulnerability, vegetation gone, trees skeletal, bald black curves in the midday sun. Born and raised in L.A., now fifty-two, I have come to understand that it’s essentially a race between the Santa Ana winds and the rain. If the rain comes first, the fire hazard is mitigated. But, if the fires come first, as they had now (and as they did last year, with the Thomas Fire and the ensuing mudslides in Montecito), we’re in big trouble. Large-to-XXL Swells Headed to California?? ?